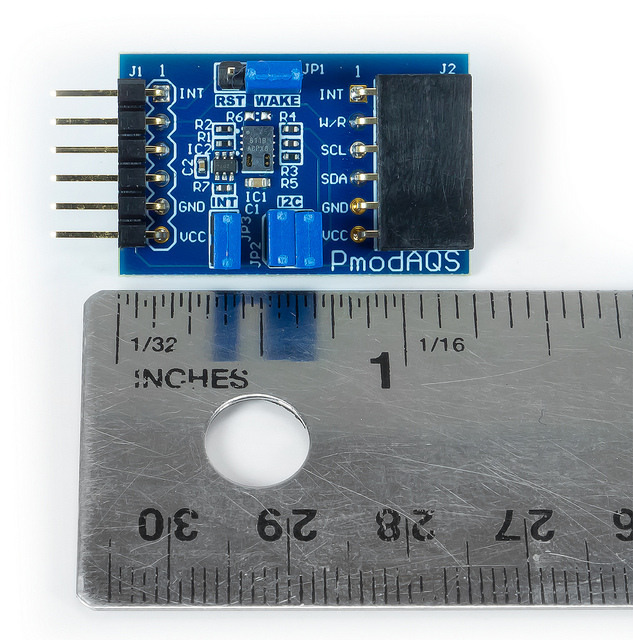 The Digilent Pmod AQS (Revision A) is a digital gas sensor for monitoring indoor air quality at low power. With the AMS CCS811, you can detect a wide range of Volatile Organic Compounds (VOCs) using the micro-hotplate technology enables a highly reliable solution for gas sensors with very fast cycle times. The Total Volatile Organic Compound (TVOC) output range is from 0ppb to 1187ppb. The Pmod AQS is designed to digitally report the Volatile Organic Compounds (VOCs) upon request by the host board. Up to 10-bits of resolution collected by allowing for longer conversion times. Micro-hotplate technology which enables a highly reliable solution for gas sensors, very fast cycle times and a significant reduction in average power consumption. The Pmod AQS communicates with the host board via the I²C protocol. 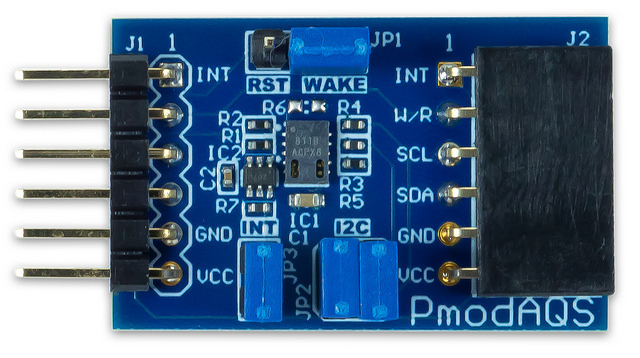 By first sending the 7-bit I²C address of 1011011 (0x5B) and then a read/write bit (high/low logic level, respectively), followed by the register address of interest at a maximum clock frequency of 400 kHz, users can both configure and read from the Pmod AQS. Header J2 on the Pmod AQS passes through all of the signals present on the main Header J1 to allow for the daisy chaining of multiple I²C compatible modules. 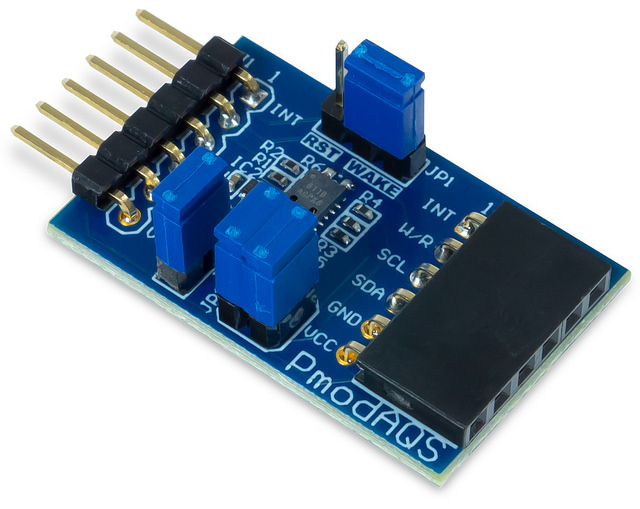 Here is the series of commands to acquire relative humidity and temperature data from the Pmod AQs in pseudo I²C code. Power on the Pmod AQS and wait at least 15 ms. The PmodAQS Jumper setting when using the Demo's are JP1: WAKE Enabled, JP2: Both Enabled, JP3: Enabled. The Pmod AQS is an ideal Pmod to use in long term Air quality application. As a very low power Pmod between measurements, long term data to measure VOC changes in an environment can easily be collected. 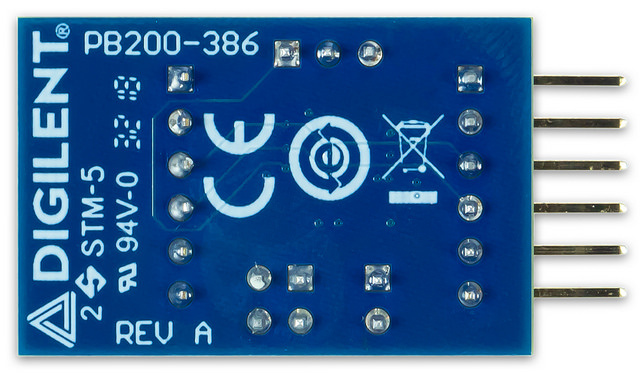 Any external power applied to the Pmod AQS must be within 1.8 V and 3.3 V to ensure that the on-board chips operate correctly; however, it is recommended that Pmod is operated at 3.3 V.
The schematics of the Pmod AQS are available here. Additional information about the VOCs Gas sensor including communication modes and specific timings of the chip can be found in the datasheet here. Example code and more specific information on how to use the Pmod AQS can be found on its Resource Center. If you have any questions or comments about the Pmod AQS, feel free to post them under the appropriate section (“Add-on Boards”) of the Digilent Forum.